Learn about San Antonio, Texas, by reading San Antonio-More Than The Alamo by Charlie Spence, Travel Writer and WTA Member. It features a mini, but thorough tour of the destination, plus all you'll need to know to plan your trip including getting there, objective information on places to stay and eat, and things to do. At the end of the article, we've provided a summary of the contact information for your easy reference. Enjoy! Once you visit San Antonio you will remember much more than the Alamo. The Alamo, one of the most photographed sites in the United States. Of course, the Alamo is a top historic attraction of this Texas city, but it is surrounded by an urban development that combines fascinating attractions with unique shops, restaurants, and charming spots for relaxing. Because the Alamo is so closely intertwined with San Antonio, let’s begin our visit there. There are five entrances into this complex but we’ll enter through the old church where we will see many exhibits associated with the heroes of that famous stand. There is Davy Crockett’s buckskin vest, Travis’ ring, a flintlock rifle used in the battle, a Bowie knife and many more reminder items from this stand against Santa Anna’s forces. The site—established in 1718 as the city’s first mission—was originally named Mission San Antonio de Valero, one of many established as homes for missionaries and their Indian converts. Disease had taken most of the Indians by 1793 and the mission was closed. Some ten years later a Spanish cavalry unit from Alamo de Parras, Mexico, was quartered in the mission. Over the years Spanish, Mexican, and rebel military occupied the site until the Texas revolution. In 1835 a group of Texan and Tejano volunteers came against the forces of General Marin Perfecto de Cos. After five days of house-to-house fighting, Cos surrendered and the volunteers occupied the Alamo. They further strengthened the defenses. Two months later—February 23, 1836—General Santa Anna arrived with his massive force. The defenders held out until a final assault thirteen days later at dawn. You will find much more of the history of the Alamo as you tour, but it is wise to get some understanding of the significance of this Texas shrine before a visit. Also, you will want to know where to look for other significant spots. 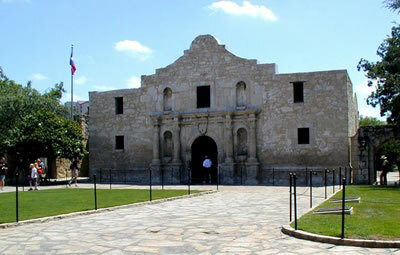 Much of the battle took place in Alamo Plaza and plaques and stones mark various sites. 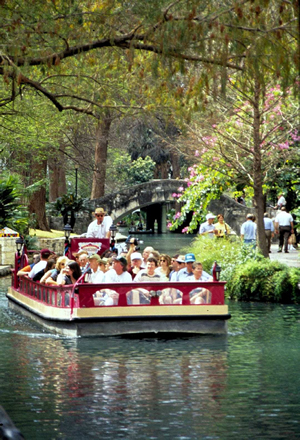 The river cruise, a 30 to 45 minute tour of the river walk area. But let’s move on. There is much more to see and do. Just across the street from Alamo Plaza is River Center Mall and Paseo Del Rio. This area, which once was a drab and dingy river bottom, now is the pride of the city. Fine shops, excellent restaurants, and nightclubs may be reached along the cobblestone walkways. Along this river walk we’ll find quiet and park-like sections and specialty boutiques, art galleries, and high-rise hotels. Take a cruise along the river walk. Narrated tours take only 35 to 40 minutes. Not far away is Milam Park, a great place to relax or give the kids a time to burn off some steam. Here will can go into the Tower of the Americas and from 579 feet above ground get a spectacular view of San Antonia. Glass walled elevators take you up to the restaurant and observation level. Nearby is Market Square (El Mercado), the largest Mexican market place outside of Mexico. Here you will find a festive combination of Tex-Mex restaurants, music and entertainment, and shops featuring goods ranging from pears to pinatas. When you are ready for a bit of culture, visit some of the places like the Museum of Art, the Zoological Gardens and Aquarium, or the Botanical Gardens. This latter is a 33-acre living museum with seasonal floral displays, Rose Garden, Sacred Garden, and other plant specimens from around the world. Take some time also to visit the Guinness World Records Museum and Ripley’s Haunted Adventure for some different type of galleries on Alamo Plaza. Here, too, is Davy Crockett’s Tall Tale Rides, a good theme park style ride through his life and times as told by Crockett himself. Over on Houston Street, discover history, as you’ve never seen it at the Buckhorn Saloon and Museum. In 2002 this was voted the best attraction of the year by the Downtown Alliance. It covers more than 120 years of area history. See such oddities as a two-headed calf and a lamb with eight legs. There’s a wax museum of Texas history. It is only two blocks from the Alamo or just 50 feet from the River Walk. Not all of the interesting and enjoyable attractions of San Antonio are in the downtown area. A Six Flags theme park is non-stop celebration of San Antonio and South Texas build around four theme areas. Northeast of the city is Fort Sam Huston, another National Historic Landmark. The oldest building on the post dates back to 1876. The army base is where military greats like Pershing, Stilwell, and Eisenhower served. Today it is the headquarters for the Fifth U.S. Army and houses the Fort Sam Houston Museum and U.S. Army Medical Department Museum. To get a real feel of the old west, travel out highway 42 west to Boerne to the Enchanted Springs Ranch. This 86-acre ranch is right out of the 1800s with an authentic old western town. The site has been used in many western motion pictures. Take a wagon ride through the ranch populated with Texas Longhorns, buffalo, horses, and many other animals. If you have time, play a round of golf at some of the more than 40 courses. The first public gold course in Texas—Breckenridge—was built here in 1916 and has hosted golfers ever since. The area averages 300 days of sunshine a year and the average temperature is about 68 degrees, perfect for outdoor fun. Like I said, after you experience all of San Antonio you’ll have much more to remember than the Alamo. Stinson Municipal Airport is just six miles from the city. Sixteen airlines provide commuter, domestic, and international passenger service. Service is available from many cities for non-stop flights. AMTRAK has service from Los Angeles through Tucson and El Paso; from Miami through Ft. Lauderdale, Jacksonville, New Orleans, and Houston; and from Chicago. Major interstate highways lead into San Antonio from all directions. A variety of restaurants offer a wide selection of cuisines for fine dining. They range from Caribbean and Continental to Southwest and seafood. There are good spots for Italian, Greek, Oriental, and others but—when in San Antonio do as many of the locals: barbeque and Tex-Mex. There are more than 90 spots in San Antonio that serve barbeque. Long a staple in the Southwest, the barbeque is still a mainstay and a cook-off classic in culinary competitions. Tex-Mex is merging of cuisines from both sides of the border. Notice: This information is current as of January 2006. It is recommended that you contact the numbers, and/or visit the websites above to determine any changes to the information.